A friend was staying last week with her car and we were finally able to try out La Ballastine. This walk, which has been on our to-walk list for a long time, follows the disused railway line between Le Cheylard and Lamastre, and takes its name from the ballast or chippings which were laid between the sleepers and the rails. The walk is 21 km in length and impractical without a second car since for some unfathomable reason there is no bus service between the two towns. Our little railway line, happily chugging away again since last year, was once part of a wider network linking the interior and high plateau of the North Ardèche with the Rhône valley and the rest of the world. The endlessly twisty roads and tracks which criss-cross the hills and valleys of the Vivarais had made commercial expansion difficult and the coming of the railway opened up a new market for timber, textiles, wheat, potatoes and tobacco, which could be transported from Lamastre down the Doux valley to Tournon and from le Cheylard, via the valley of the Eyrieux, to La Voulte sur Rhône further south. 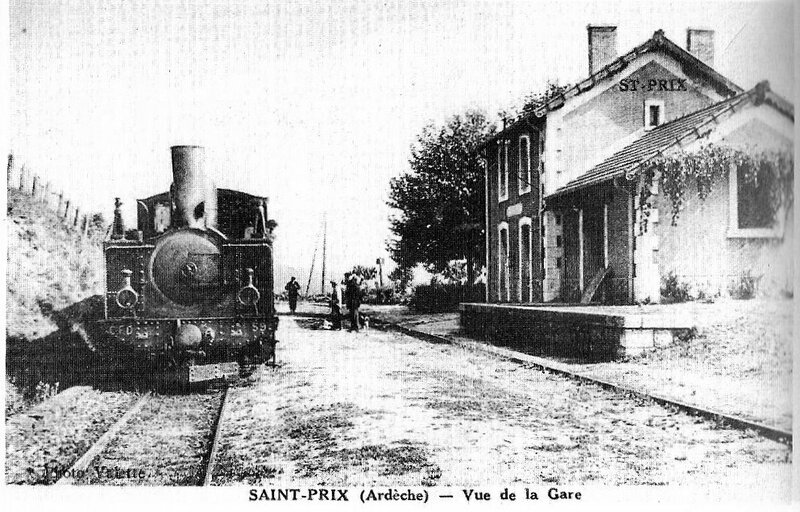 Both lines opened in 1891, followed in 1903 by extensions linking Le Cheylard with St Agrève and Lamastre. The engineering skill and manpower involved were impressive although in certain sections the gradients proved to be almost insurmountable. 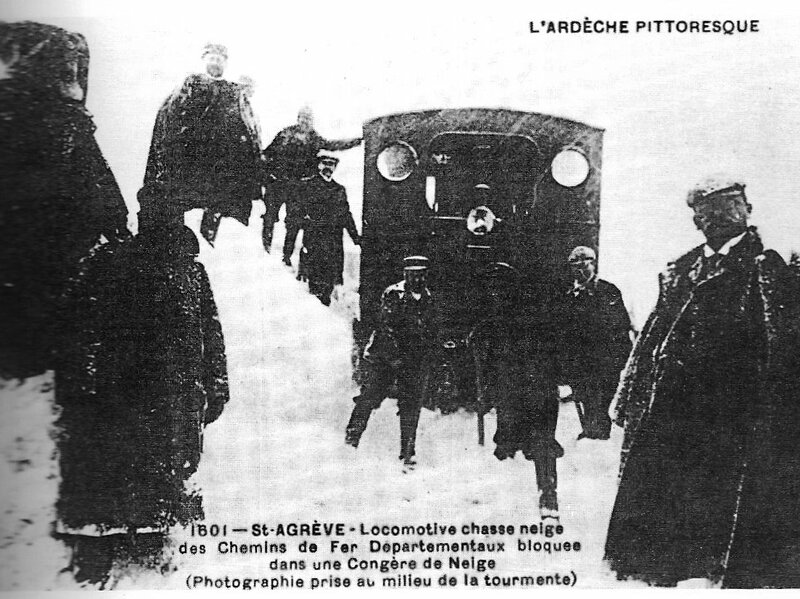 The pull up to St Agrève at 1,080m for instance required two locomotives, which frequently had to be dug out of snowdrifts in the winter. This section of the Chemin de Fer du Vivarais was almost never economically viable. In its heyday before the Second World War the line carried over 600,000 passengers and more than 150,000 tonnes of freight annually. After the war, road improvements and the increase in road haulage led to an irreversible decline and all the lines closed in 1968. 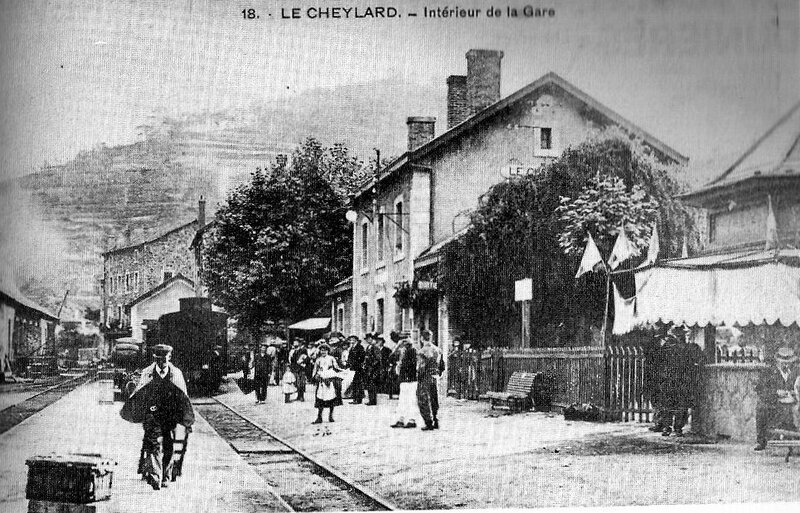 Only our section, between Lamastre and Tournon reopened a year later as a privately run tourist line. Leaving le Cheylard, at an altitude of 440m, the track rises steadily in a perfectly calculated uniform gradient to 620m, its highest point, at les Nonnières, where it passes under the village in a tunnel over 300m long. From there it descends to Lamastre, which is located at 380m. Here we are on the Lamastre side of the Nonnières tunnel, ready to begin our descent, with a photo from earlier times. The weather was perfect for walking and we had a great day. The climate and vegetation is very different in the upper valley of the Eyrieux where the walk starts from what we are used to in the Doux valley. 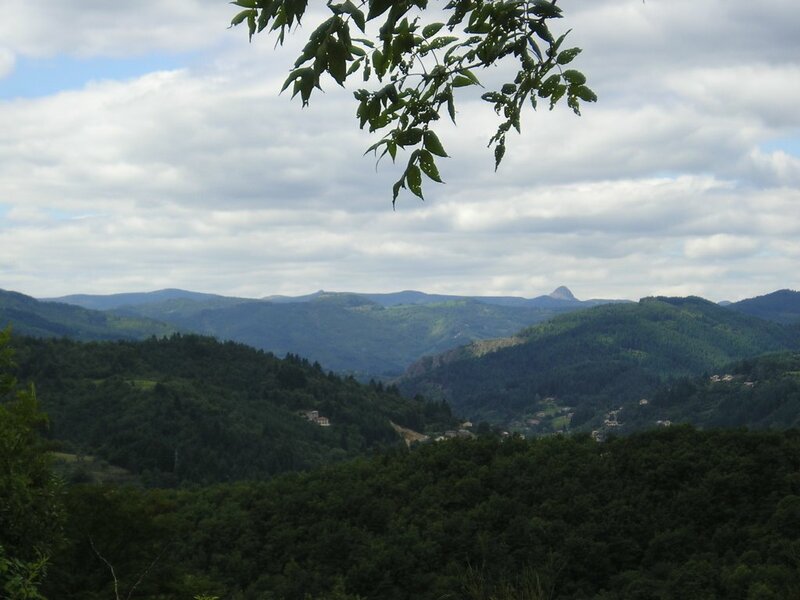 The hills are steeper and thickly clad with coniferous woodland and there are great views across to the highest peaks of the Ardèche mountains and the distinctive outline of the Gerbier du Jonc, the source of the Loire. There is something very evocative about walking an entirely artificial route like this one which was created with such skill and effort. As we passed through cuttings we could appreciate the heavy labour that had carved them out of the rock. The tunnels are impressive and the many viaducts are beautifully crafted from dressed stone and edged with railings in uniform style all along the line. Many of these viaducts are immensely high and must have been spectacular when first built, although now they are half hidden by the woodland which has grown up around them. Once past les Nonnières we followed the river Sumène through a gentle, fertile area known as the Golden Valley and famous for its apples. There are also pear and walnut trees in abundance and we were glad to see that this is going to be a very good year for autumn fruit and nuts. The line frequently runs close to farms and tiny hamlets, most of them still inhabited and each with its well-tended kitchen garden. How life must have changed for these farmers with the arrival of the train! We imagined the groups of people with their baskets of produce waiting at the little halts to go down to Lamastre on market day, no longer a jolting journey of several hours over the tortuous cart tracks, which were dusty in summer and eroded by the winter rains. As we approached our destination and the track levelled out the Sumène was also reaching the end of its journey since it joins the Doux at Lamastre. We could picture the passengers gathering their belongings together and preparing for a busy day in a bustling atmosphere, so different from their usual quiet routines at home on the farm. With people to meet, deals to be made, news and gossip to be shared over a glass or two of something the time certainly must have passed pleasantly. We really enjoyed this walk and are already planning to try out another section down the valley of the Eyrieux from le Cheylard. It is around 25kms and friends of ours have just done it on their bikes as a round trip. Their reward was a stop in St Sauveur de Montagut at Terre adélice, makers of the best ice cream in the whole wide world never mind the Ardèche and a favourite with our Walksweekers. Can’t wait!